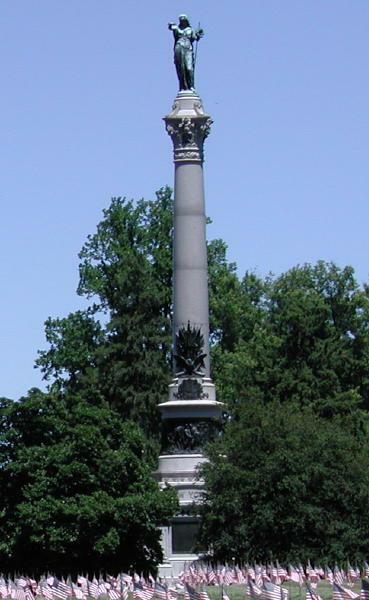 This monument, "To the officers and soldiers of the State of New York who fell in the battle of Gettysburg," is appropriately located in the Gettysburg National Cemetery, on the lawn near the main entrance from the Baltimore Pike. It is placed at the centre of a circular plot, 90 feet in diameter, surrounded by a pathway 10 feet wide. This walk is connected in four directions, with the broad drives bounding the lawn, by paths 8 feet wide, laid out with slight curves. These footways are constucted in a substantial manner of broken limestone, and surfaced with screenings. 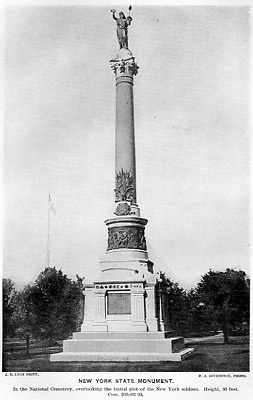 The monument, which faces the plot where New York's soldiers are buried, is 27 feet 8 inches square at the base, and has a total height of 93 feet. The polished shaft measures 5 feet 6 inches in diameter at the lower end, and is 33 feet high, cut in four sections. The bronze statue - "a female figure, typical of the State of New York, decorating the graves of her soldiers" directly in her line of vision - is 13 feet high, including the plinth, which measures 3 feet 1 inch in diameter. The bronze alto relievo is 9 feet 8 1/2 inches in diameter and 5 feet 6 inches high, divided into four panels, upon which are portrayed the general officers from the State engaged in the battle. The bronze trophy and eagle, at base of shart, are 3 feet 8 inches at the widest part and 8 feet 6 inches high over all. The bronze inscription tablets on the front and reverse are each 5 feet 4 3/4 inches wide and 4 feet 7 3/4 inches high. The lower edge of bronze alto relievo is 23 1/2 feet above the surface of the ground, and the base of the polished shaft is 35 1/2 feet from the ground. The granite used in the construction of the monument if from Hallowell (Me. ), and the polished shaft is of Fox Island (Me.) granite. The statue, alto relievo, trophy, inscription tablets, State shield and corps badges are cast in Standard bronze. The Hallowell Granite Works were the contractors for the granite work. The contractors for the bronze statue, alto relievo and inscription tablets were the Henry-Bonnard Bronze Company; and mr. Maurice J. Power was the contractor for the bronze trophy at base of shaft, State shield and corps badges. Sculptor, Caspar Buberl. Cost, $59,095.30. *Source: New York at Gettysburg, page 1383.